When mental health nursing student Mark Collins experienced a family tragedy, it changed the course of his career. Mr Collins was studying graphic design when he learned that his cousin had committed suicide. 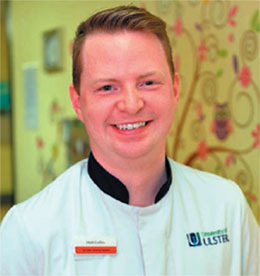 Having always aspired to be a nurse, it prompted him to apply to study mental health nursing at the University of Ulster. Mr Collins began his course in September 2012 and will graduate later this year. During his studies, he has worked extensively with older people; his first clinical placement was on a long-stay mental health ward for men aged 65 and over, he has completed a community placement for older adults with enduring mental illness and his dissertation focused on older people in the community diagnosed with depression. But it was a placement on an acute ward for people aged 65 and over with functioning mental illness that cemented his passion for working with older people. ‘I cared for service users from admission, when they were at their lowest point, to when their mental health was restored and they were ready for discharge,’ says Mr Collins. During this placement Mr Collins noticed that there were no group activities for patients on the ward. Drawing on his artistic background, he decided to start an art therapy group, with the aim of improving service users’ social skills and self-esteem. Using materials costing just £10, he ran an art therapy session every shift he was on during the six-week placement. The finished product was The Tree of Regrowth and Recovery – a tree painted on the wall surrounded by the service users’ framed artwork. ‘The patients told me that what made them happy was being around wildlife and nature, so we used this as the project theme,’ says Mr Collins. This innovative project saw Mr Collins become the worthy recipient of the Andrew Parker Student Nurse Award at this year’s Nursing Standard Awards. When he is not working, Mr Collins enjoys spending time with his partner, friends and family, and indulging his passion for arts and crafts. But he admits he can find it difficult to switch off when not on duty. Mr Collins says he would like to see more services available for older people with mental health problems, especially addiction services. Asked where he would like to be in five years’ time, Mr Collins says studying for a PhD focusing on art therapy. ‘One of the service users in the art therapy group told me she had not painted since she left school, but she found it really enjoyable and relaxing.